Pre Finishing by Elite Finisher Inc.
Pre-Finishing Services by Elite Finisher Inc.
Want freshly painted cabinets or trim without odors in your home or facility? Limited space to work? Consider pre-finishing services by Elite Finisher Inc.. Pre-finishing requires a niche skill set different than traditional painting. We've been in the pre-finishing business since 2008. Whether you'd like prefabricated metal parts coated to match an existing structure, or want beautiful, custom pre-finished cabinets, Elite Finisher Inc. will complete the job on time and within your budget. We'll arrive to your home or office to assess the job and provide a quick, fair quote on pre-finishing. Your items will be brought to our state of the art facility, completed and delivered dry and beautiful back to you. If you are looking to finish your cabinets, or re-stain your interior trim, pre-finishing may be your best option. Calling Elite Finisher Inc. to pre-finish your items means no odor, fumes or mess in your home. Items are picked up and delivered, fully assembled and ready to install. Elite Finisher Inc. uses a variety of finishes, including lacquer, paint and stains and can match just about any color. Pre finishing also provides consistent, thorough coverage for a seamless final result. 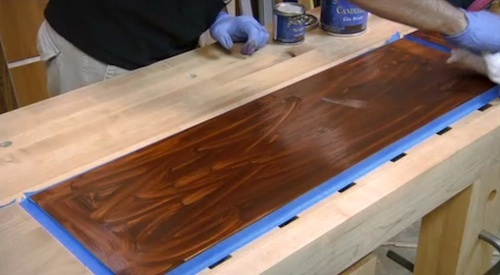 Save time by having the pre staining experts finish your wood, metal or fiberglass pieces and enjoy the benefits! Items Typically Pre-finished by Elite Finisher Inc. Interior Pre-finishing by Elite Finisher Inc.